President Varela meets Security Minister Aguilera and police commanders in Chiriqui. Photo by the Ministerio de Seguridad. There is no reason to think there will be less corruption in this government, than in any previous government. 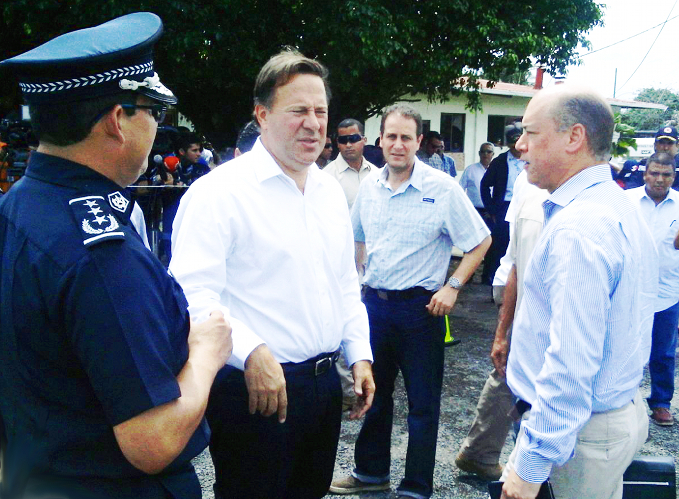 President Juan Carlos Varela spent the better part of this week grandstanding against crime in Chiriqui. Violence there is nothing new, but this episode does show up how the president shirks from taking any stance on a problem as a matter of course — thus making matters worse. In the event, the heart of this particular problem has been previously documented. The 31 March 2011 issue of El Panama America carried an interview with a former National Police Director, focusing on a major cause of disorder in Chiriqui. Questioned as to a then revealed cable, don Gustavo Pérez de la Ossa states “there are no evidence” substantiating what an August17, 2009 US embassy cable stated had been garnered “from official Panamanian sources.” With her brush then-ambassador Barbara Stephenson painted a word picture of having “credible information that a network of corrupt National Police line officers, as well as politicians, who smuggle drugs and weapons crossborder with Costa Rica, in vehicles with government plates” (as El Panama America summed it up, with a duty of care regarding a presumption of innocence omitted in the official in-house embassy cable, which identifies one lieutenant colonel by name.) Yet shortly thereafter, said officer received a scholarship for continuing military education in the USA plus a desk job on his promotion to Panama City headquarters upon his return. This volte-face suggests Uncle Sam has sundry “Tailors of Panama” within local military ranks — village gossips who regularly deliver stories about competing peers which are rather economical with the truth. Or worse. Little would appear to have changed since in the frontier no-man’s land — even with Washington´s darling SENAFRONT border police — where police code “Sierra 97” for absolute radio silence and “Eyes left!” is the norm for staff on routine border patrols: “Hear no evil, see no evil, speak no evil.” Even if Robert Lady is not about. Those of us who eat three square meals a day bear an obligation to those who do not, as well as to discharge it by bearing witness to the rule of law as it should be carried out — with probity.